Stick with Ash 'til the wheels fall off. 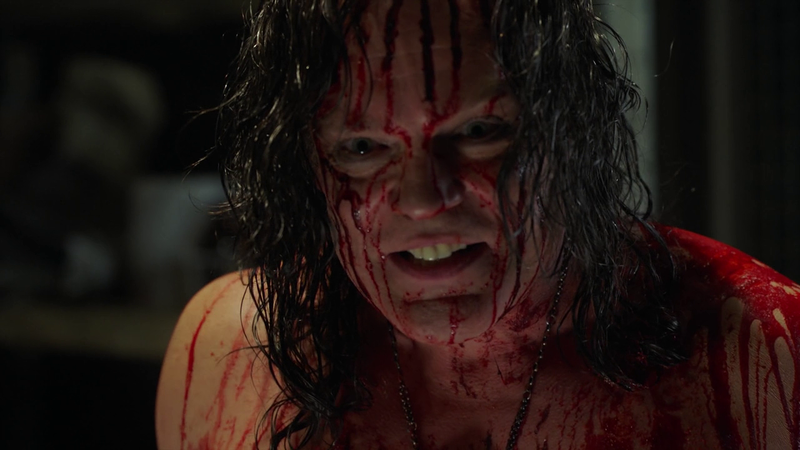 Despite the best efforts of Kelly Maxwell (Dana DeLorenzo) and Ruby Knowby (Lucy Lawless), all the dagger slashing and bullet firing they did, the demon Baal (Joel Tobeck) has been unleashed in our world. 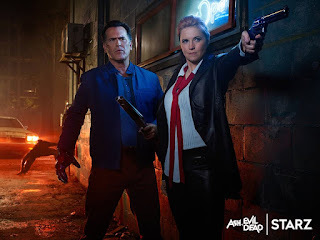 It's an unfortunate turn of events for our heroes, but it makes sense for the show - Kelly and Ruby already wiped out the monstrous demons that were causing trouble before, so now this second season of the television continuation of Sam Raimi's Evil Dead film franchise needs a new "big bad". I'm a little worried about Baal as the big bad, however. Not because I think he'll be too much of a threat for our heroes, but because... he seems kind of lame. He's just a dude with long hair and a talon that he can use to slice people's flesh off. When I was watching The Evil Dead, Evil Dead II, and Army of Darkness, I never would have expected that someday the biggest evil our hero Ash (Bruce Campbell) would have to contend with would be a regular guy with long hair. Baal's not so impressive in his normal form, but his arrival does make for a great episode that brings to mind John Carpenter's 1982 classic The Thing. Because, you see, Baal doesn't just walk around as himself all the time. Once he slices a person's flesh off, he is able to put that flesh on himself and, as far as anyone around him is concerned, become that person. So if our heroes are among a group of people, Baal could be any one of those people and there'd be no way to tell just by sight. That is the scenario our heroes find themselves in here, in this episode directed by Michael J. Bassett - who by now is an Ash vs. Evil Dead veteran, having helmed the episodes 'Bait', 'Books from Beyond', and 'DUI' - from a script by William Bromell, who has previously written episodes of Homeland and Borgia. As far as Ash is concerned, the evil has been defeated, but he ends up being arrested by Sheriff Thomas Emery (Stephen Lovatt) for the murder of a girl who was actually a Deadite when Ash killed her. Ash is thrown in the local jail, where his childhood friend Chet Kaminski (Teed Raimi), a prostitute Chet propositioned, and some other people are also behind bars. 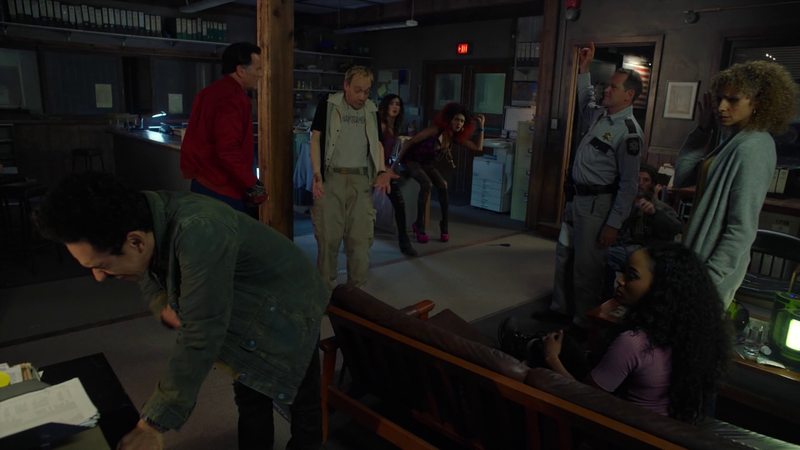 Soon Kelly and Ruby show up, along with Ash's sidekick Pablo Simon Bolivar (Ray Santiago), and Ash's high school sweetheart Linda Emery (Michelle Hurd), who is married to the sheriff now and has a daughter with him, also arrives with their daughter Lacey (Pepi Sonuga), who is still traumatized from her experience with Ash's possessed car in the previous two episodes, 'DUI' and 'Last Call'. 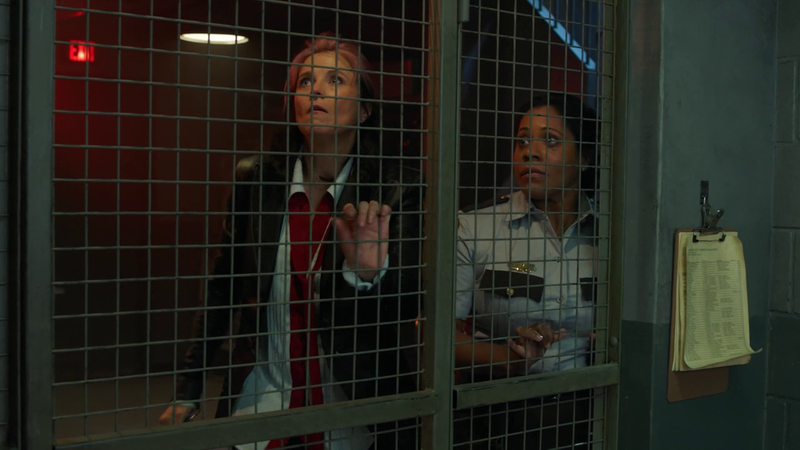 So here we have a bunch of characters who already have issues with each other getting stuck in one location while trying to figure out which of them might be Baal. The paranoia is through the roof, as is the tension, and I love stories like this so I was having a lot of fun watching it all go down. As if the Baal issue weren't enough, poor Pablo is having even more trouble that can be traced back to the Book of the Dead. Things aren't looking good for Ash's devoted pal, but hopefully they won't get too bad because I sure don't want to lose Pablo from this show. Pablo is awesome! This episode was pretty awesome as well, delivering the bloodshed and laugh-out-loud moments you can usually expect from this show. There are a couple hilarious physical comedy gags near the end that totally took me by surprise. Yeah, I'm not sure about Baal, but I'm willing to give him a chance to win me over with his evil shenanigans.